I grew up on a farm in Pasco County, not too far from the Green Swamp Preserve. The Green Swamp is a massive tract of land, a chunk of forest and wetlands that has an uncanny otherworldly feel to it, especially early in the morning, or around sunset. The thing about wilderness in Florida is that you can never walk into the same forest twice, everything is always changing, shifting, growing, dying. It seems like every single time I’ve gone into The Green Swamp, I’ve seen something that I’ve never seen before, and it’s the kind of place I feel I would never be able to fully comprehend, no matter how hard I tried. Places like that tend to breed legends as well as they breed mosquitoes, and I grew up on stories of strange things that lurk out in the Green Swamp. Most famously, The Green Swamp is one of the homes of the fabled Skunk-Ape, sort of Florida’s version of a Sasquatch. The Skunk-Ape is described as a huge upright-walking gorilla or orangutan, sometimes with more of a human-like face, and a strong earthy or weedy odor to it. I have spent a lot of time in Florida woods and swamps, but I have never seen nor smelled a Skunk-Ape. There are, however, some dedicated Skunk-Ape hunters out there (including Tim Fasano, whose Skunk-Ape dedicated YouTube channel has over 5000 followers). While I remain optimistically agnostic on the issue of smelly ape-men, I am very interested in places that will make someone feel as though monsters are lurking behind every cypress tree. The Green Swamp is certainly one of those places, the landscape itself tends to inflame the imagination, and the Skunk-Ape isn’t the only example. Ghosts lurk in the abandoned homesteads and turpentine camp cabins, UFOs beam back at you in the night skies, and there are wild pigs out there bigger than station wagons. It seems the Green Swamp works like a 300,000-acre Rorschach test, or maybe a psychedelic drug you can walk through. Jacques LeMoyne’s images of the flora, fauna, and people of 16th-Century Florida are often considered to be highly romanticized. He was part of an early French expedition, which established the small settlement of Fort Caroline on the banks of the St. Johns River. LeMoyne was one of the first European artists to visit the New World, and his drawings of the Timucua are some of the only extant first-hand images of one of Florida’s original Native cultures (By the 1590’s European diseases and exploitation had decimated the population). I find one of LeMoyne’s images especially compelling, it shows a group of Timucua battling an alligator that looks to be about the size of a pickup truck. One could think LeMoyne was exaggerating, or he had misremembered what he saw (the original drawings was burned when the Spanish attacked Fort Carloine; LeMoyne re-drew everything from memory when he returned to Europe). At the same time, LeMoyne’s images, especially of the people, are clearly the work of the exoticizing imagination of the European gaze. And that gator couldn’t possibly have been that big, right? That video was a viral hit last year, it was taken at Circle Bar B Ranch, a reserve south of Lakeland. That gator is maybe 15 feet, not quite as massive as the monster depicted in the LeMoyne etching, but also not that much smaller either, and if I imagine a world before Florida's massive population booms of the 20th Century, before the heavy habitat destruction that came with that boom, and before the commercial hunting of alligators for fancy shoes and handbags, it isn't too much of a stretch to imagine gators commonly growing to that size. Both The Green Swamp and Circle Bar B are excellent places to go searching for monsters, both the real and the imagined, and they're both fairly easy drives from Tampa or Orlando. Get an early start, pack some water and snacks, and wear comfortable shoes. 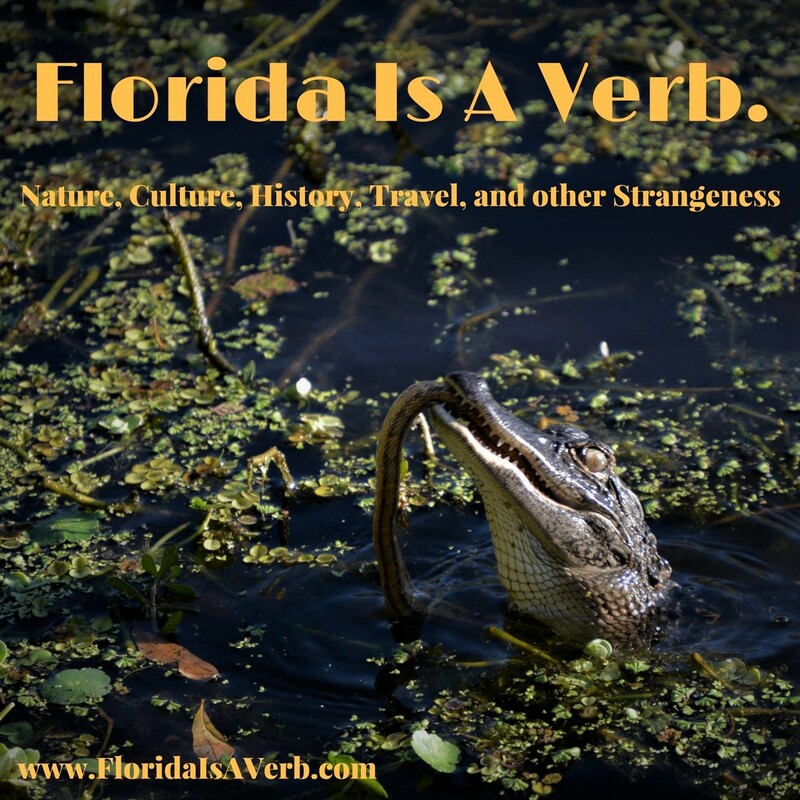 Even if you don't see a Skunk-Ape or a giant gator there are many other amazing things to see and photograph. I recently went on a birding trip to Circle Bar B, and I'll be posting a full report, with some photos, soon.